So I did this collage thing. It’s pretty simple actually, I did it with a black pen. I wanted it to be kind of like the drawings you see in the back of your notebook you know? I think I got it, or at least I’m pretty satisfied with it. I was listening to this interview they did to Kurt Cobain, plus I’ve been reading all the drug books. So all that kind of insipred it. It’s Chaos VS Good. Not like explosions and apocalyptic chaos, but inner chaos and sadness. I put things that make me sad, I asked other too. Then I put things that make me happy, and I also asked others. I thought I was finished but then I got some newspapers, whcih were originally for soemthing else I was going to do, and I enedd up cutting out words that I though added to it. I had to work with Spanish because thats the language my newspapers are printed in. I’m pretty happy with the collage, its small, its super different from what I normally do. Its more relaxed, yet dark and it actually means something for me. I can feel the emotion, I don’t know if its because I made it or what. 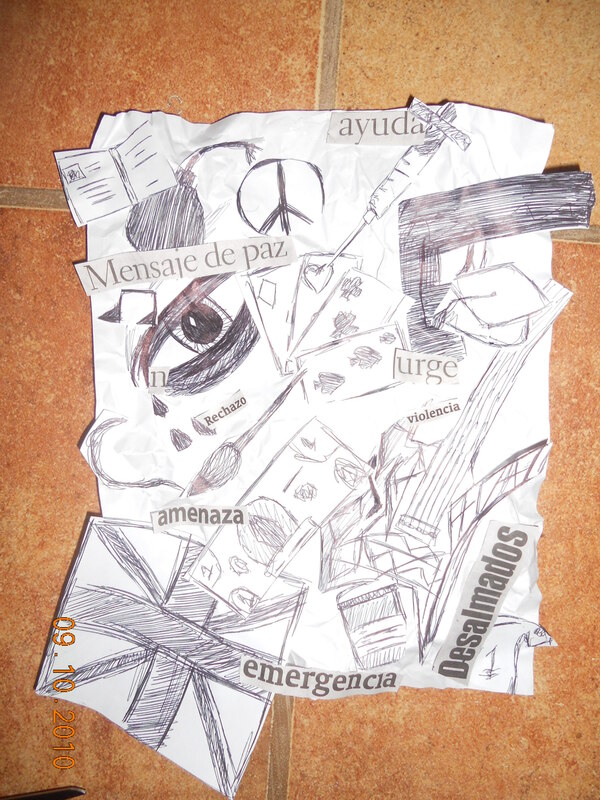 This entry was posted on Saturday, October 9th, 2010 at 9:03 pm	and tagged with art, Chaos, collage, feeling, good, newspaper, Pen, sketch, word and posted in art, random. You can follow any responses to this entry through the RSS 2.0 feed.